Those of you who have seen me in person know that I’m a little on the short side — 4’9″ to be exact. I barely reach Stephen West’s shoulders. So, when I heard about Teresa Gregorio’s Knit Petite Project, I knew I had to reach out. 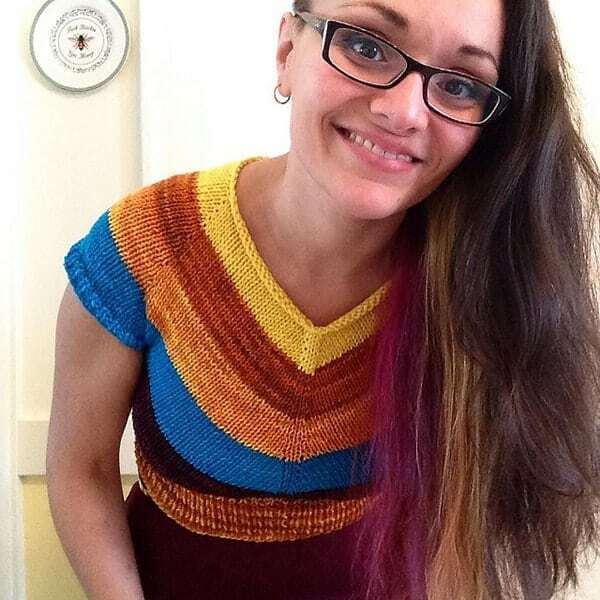 Teresa is a designer under the name Canary Knits, who has published patterns for Knit Picks as well as in Knitscene, so she knows a thing or two about construction. 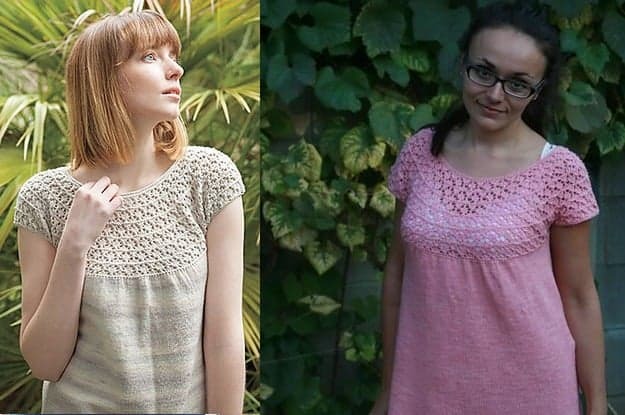 Her project has started a fascinating conversation about petite sizing, common issues that petite knitters run into and altering patterns to get the best fit. I chatted with Teresa about what she’s learned and what her goals are for the project. What inspired the Knit Petite Project? I started this project because, being petite myself, I’ve found there’s a lack of clear, centralized resources and discussion about the petite person and knitwear. I love that in recent years the knitting community has opened up conversations about different sized individuals in a body-positive manner. We have a number of great resources that talk quite specifically about, for example, the plus sized woman’s body and options she has for knitwear from aesthetic choices to more inclusive size ranges. 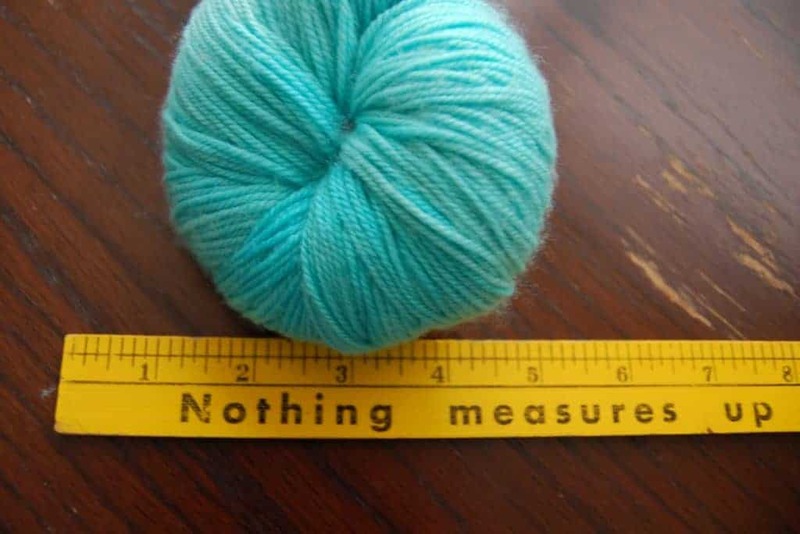 A likewise petite-specific conversation about height and vertical measurements can create a community that knitters can go to and learn more about fit. I think it’s a conversation worth having, and that’s what I’d love for the #KnitPetiteProject. I want us all to take the power into our own hands to shape our clothes to suit our tastes. We’re all makers, and that puts us in a fantastic position to achieve the modified fit we want. To do that, I thought it would be great to have a thorough, in-depth discussion about sizing and its history, how we do or do not accept the sizes available to us, how petite people are catered to, what we want to change and how we can change it. Ultimately, I think the most practical application of the Project is a community built around supporting each other through suggestions, conversations, a thorough online resource, and (hopefully!) a KAL later on this year. If you feel you fit into the petite knitter category, join us! And please remember, for the #KnitPetiteProject, petite is a vertical concern and includes women of all ages, body shapes, and weights. What have you learned so far and what has surprised you? There has been SO much I’ve learned already! I’ve been quite careful in selecting resources, and have been steeped in scholarly papers over the last few months regarding sizing in clothing design. For example, the book Sizing in Clothing: Developing Effective Sizing Systems For Ready-To-Wear Clothing is filled with information from the history of “standardized” sizing (which isn’t that old of a history!) to specifics on grading and serving modern populations through computer-aided design software and 3D scanners that can produce data for a more representative, accurate fit. I’ve also learned so much from discussions with other knitters about sizing; there’s a lively thread on Ravelry that in part inspired me to start a Ravelry group specifically for the #KnitPetiteProject. Hearing from others who have such deep expertise and first-hand experience has been very rich and rewarding! I appreciate their generous sharing. I’m 5’1”, and have been since I was 10 years old. I actually hadn’t given a lot of thought to my height (outside of those flares I used to wear in high school ALWAYS dragging on the ground and getting ripped up). I began considering fit a number of years ago when I started to design knitwear and sew garments for myself. Seeing something I knit in “my size” on a person of the “same size” was VERY illuminating. My most recent post (May 2) for the #KnitPetiteProject gives a number of examples of how vertical measurements can affect the fit of a knit sweater. For example, yoked sweaters extend a bit too far down my upper torso. This is a great example of how my shorter vertical measurements don’t line up with what the sweater assumes I’m measured, with results that I’m not happy with and are a bit more complex to alter than simply making it shorter. I haven’t yet used Amy Herzog’s Custom Fit, but I love what I’ve seen of it and her Craftsy class on the topic. She’s thorough and body-positive, which is very important to me. What I would really love is, if people are keen, we can hold a #KnitPetiteProject KAL later on this year. In it, we can each pick a sweater and work with each other through conversation and sharing online to consider what we would like to modify, and how we could achieve what we want. Amy Herzog’s Custom Fit software is perfect for this! And I’m very happy to hear you’re pleased with the results you’ve had from it. What do you think knitwear designers can do better to accommodate a range of sizes? As a designer yourself, how is this a challenge? Knitwear designers need size charts, and any size chart functions by averaging and assuming a body shape. So that’s a big challenge for designers. Creating a petite sizing chart would require thorough anthropometic data collection, which is a huge undertaking. I’ve been able to find size charts for petite women (up to a bust size of about 42”), but not beyond that. One size group that I’ve had a heck of a time locating detailed charts for is petite plus women. A suggestion that’s come up during #KnitPetiteProject discussions is for designers to add, when appropriate, suggested lengthen/shorten notes within the pattern. Sort of like a sewing pattern would. That said, row gauge and stitch gauge are tied to each other and sometimes it’s quite complicated to separate out, depending on the design elements and construction involved in the pattern. What is crucial for knitters to know about fit and modifying patterns? First, there’s NOTHING wrong with your body. Any fitting issues are simply a result of the fact that the shape of human bodies is very complex, and we are all going to differ from a sizing chart in one way or another. And second, I want to encourage people to feel empowered to modify modify modify for THEIR own tastes, preferences, and body. This can be daunting, because sometimes I think it may be difficult to know why you dislike the fit of something, or why it’s fitting you in a displeasing way. It’s YOUR knitting, so change what you want, whenever you want to! My hope is that the #KnitPetiteProject will help with this, as a resource and community filled with talented, kind, thoughtful, supportive, and body-positive individuals. This entry was posted in Q&A and tagged interview, knitpetiteproject, patterns, sweaters.